If you’ve been feeling neglected by the Goddess of Love lately, don’t worry — Hannah Maquiling, college sophomore, is in training to take over. The Original Goddess is missing, but Hannah is Interim Goddess now, and she should figure out how to solve humanity’s love problems soon. Quin (God of the Sun) is still her mentor, still really hot, but apparently isn’t as honest about his other earthly relationships as she thought. It’s frustrating, and enough to make her check out possibilities with Diego (God of the Sea) and Robbie (Cute Human). Hannah Maquiling is still the interim Goddess of Love, and this time around, she’s taken her best friend Sol as her project. Not because she was summoned, but because Sol is her best friend and if her goddess powers can help, then she would willingly use it. But instead of getting Sol together with someone, Hannah is actually trying to split them up. She’s all for her best friend’s happiness, yes, but not it if involves a boyfriend who steals from people. That’s what the Goddess of Love would do, right? 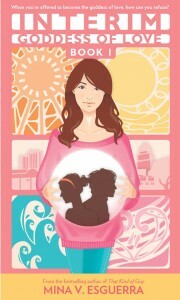 After a long wait, the second book of Mina V. Esguerra’s Interim Goddess of Love series is finally out! I was really, really excited to read this that even if I said I would finish reading Les Miserables first before anything else, I dove right in. I was so excited to read about Hannah, and the cute guys (god and human) around her. Hee. 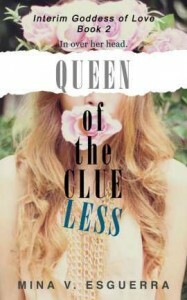 Queen of the Clueless is still as entertaining as the first book, despite having a slightly different tone. I liked how there seemed to be a villain in this book, someone who seemed like a complete mystery to them, even the gods. Somehow this had less of the cutesy romance and more of the fantasy. While I still kind of wanted more swoon, I think seeing more of how the gods and goddesses’ powers work was also fun. There was more Diego here than Quin, although since we’re in Hannah’s head, Quin was always still there. My heart went out to Hannah at the final parts of the book — girl, I think most of us have been where you are, too! Except maybe we didn’t fall in love with the God of the Sun. I liked how we got to know Diego here, though, and it feels like it’s always more fun when he’s around. Robbie the Cute Human is also growing on me, and I may be thisclose to changing my side from Quin to Robbie. But who knows what will happen by the third book? Queen of the Clueless’ Philippine edition isn’t out yet, but I think Interim Goddess of Love is already making its appearances somewhere. I have yet to spot some for myself, though! :( i want book 3 right now! :D I want mooore of Quin. BOOK 3! I hope Mina releases it this year. Nice guys should get the girl! Haha. Team Robbie!